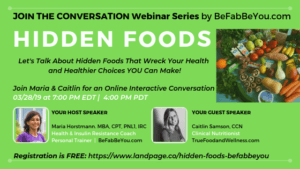 Webinar on Hidden Foods: 3/28/19 – register today! At the end of this post, I also added three of the workouts I did during the week. For more routines, images, and blurbs, connect with Maria on Instagram or Facebook. Say hello to your beautiful kidneys!!! March is also National Kidney Month. Most of us also know that we can operate with one kidney only. Phew! OK, let’s avoid getting down to one. Did you know that the kidneys are also responsible for regulating the pH of the blood (7.3 – 7.4) and elimination of acid residues? It’s a beautiful thing!!! We measure the function of the kidney through the pH in the urine. A TOXIC diet and lifestyle, including high stress, = decreased in pH and higher levels of acidity. As you may know, I used to have pre-diabetes and chronic digestion and G.I. issues. I did not know I had prediabetes–the numbers showed but my doctor at the time didn’t think it was that important to tell me because I was in my mid-30s, exercised, and didn’t have a family history of diabetes. I guess he was waiting for me to be the first. I said NO FREAKING WAY!! My journey to reverse these conditions is what got me to transform my life and health. As a former super sugar addict, I know well this type [sugar & carbs] of addition. 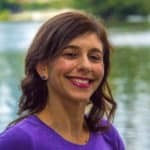 Today, as a health and insulin resistance coach, I am passionate about educating and helping people to restore balance, control, and health through lifestyle adjustments. 1) High glucose levels can damage the blood vessels in our kidneys, impacting their function. 2) High glucose levels can cause the kidneys to filter too much blood—extra stress/pressure that can affect their filtering system abilities. 3) Often high glucose levels can lead to high blood pressure (because of the damage of blood vessels caused by high glucose levels). Hypertension also damages our kidneys. Do you have to have diabetes to ignite this nightmare? Nope. As highlighted in this article, all starts with pre-diabetes. What is also unfortunate is that a large percentage of the population have prediabetes, just like I had, and have no clue. Folks, whether it’s sugar addiction or whether carbs addiction or whether is both, take a step today to take control of it and rediscover good health with peace of mind. I am available to help! Today, March 20th is World Oral Health Day! Do you brush your teeth at least twice a day? and especially before going to bed. Or is the bacteria happily thriving overnight? I know this sounds nonsense. God knows how many times I went to bed without brushing my teeth. LAZY ME!!! A dentist will say we need to brush for 2 minutes (30 seconds in each area of the mouth). It’s easy to disregard the relationship between oral health and diseases. Yesterday, I touched on high blood sugar levels and the kidney. Today, I am going to touch on high blood sugar levels and oral health. Yes, the stress the body goes through to fight infections elevate blood sugar. Any type of chronic stress does that. The body needs the energy to fight–whether you are feeling it or not. Often, nutrition is the go-to discussion point for the management of glucose, insulin, and chronic and inflammatory diseases. This study shows that prediabetes may be aggravated with periodontal diseases. The most common is the infection of the gums. According to the CDC, 46% of adults over 30 have signs of gum disease. Now let’s process this…imagine a person who consumes foods high in sugar, added sugars, and simple carbs, live a very stressful life (causing blood sugars to elevate), and neglect health of his/her teeth. It’s not one thing or another that get us to weight gain, fatigue, ugly medical report, and so on. It’s a comprehensive approach to health. Taking a holistic approach is a good strategy to re-establish health. 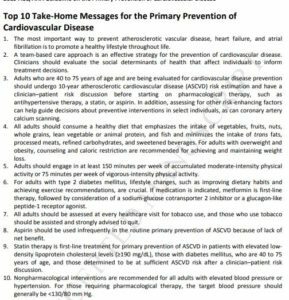 Heart Health Month was February. Well, you may agree with that heart health is an EVERY DAY! Click here to view/download the full 103-page doc to geek out if you’d like to. 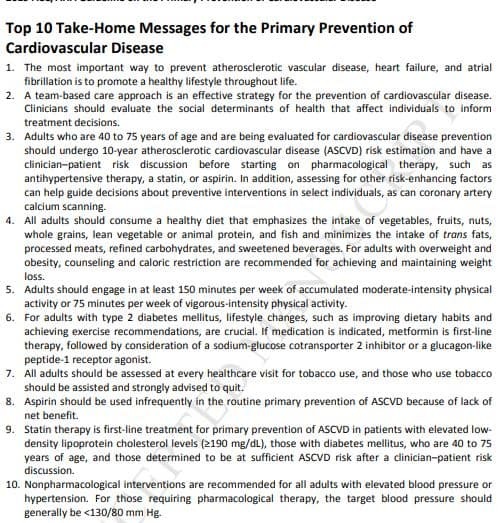 The place to start is page 4 with the top 10 take-home messages (screenshot below). Ready to talk/learn about what/how Hidden Foods That are Wrecking our Health and Healthier Choices? That’s the next topic on ‘Join The Conversation’ Webinar Series on 3/28 at 7pm EDT | 4pm PDT. Register to join us LIVE (or watch the reply) and receive a copy of the Nutrition Action Tracker. March 22nd is World Water Day!!! Today is the day you make assure you drink enough water…and tomorrow and every day after. #1) Check out the video below for some interesting info about how space is helping with the water challenges. #2) Is it possible that your fatigue, headaches, brain fog, muscle cramps, constipation, high blood sugar levels, dizziness, dry skin, and even disrupted sleep be a consequence of dehydration? YES, I COULD. Yes, the quality of water is also important. That chat is for another day. One step at a time. Work your way up to drinking enough and be consistent. Then, look into the quality of the water. Are you drinking a minimum of half of the body weight in oz a day? 100lbs weight = 50oz water? I am saying water, not beverages that are mildly dehydrating…Measure. If you are not, get yourself a big bright bottle, set a reminder on your phone for every hour to drink, and drink up! I used to be severely dehydrated, drunk about two cups a day. I don’t recommend it. Take a step that can greatly improve your health. LET’S ALL RAISE A GLASS FOR WATER! Want more than three routines a week with photos and other blurbs? Follow Maria on Instagram https://www.instagram.com/be_fab_beyou/ or Facebook www.facebook.com/BeFabBeYouWellness. When you are ready to work with a personal trainer who is more than a trainer to motivate you, keep you accountable, and help you build your physical and mental strength, I am your trainer and coach. Check out the ‘Taster’ offer to new clients of three (3) sessions for $99.00 HERE. No equipment? No problem. Live far away? No problem. Have body part issues? No problem. What it’s often the problem is NOT exercising. Lack of movement is often the problem. What’s in your way? What are the excuses? What one small thing you can do today? Remove one barrier at a time. Move your fanny!